Eid is just around the corner! 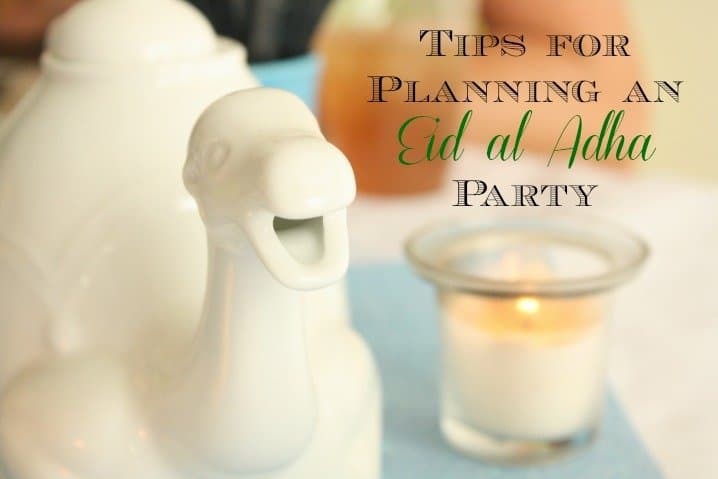 I am busy working on a guest post for My Halal Kitchen about what Eid preparations are like in Morocco. The sheep have just started coming into the city and people are beginning to prepare. I’ve heard many butchers will close for the rest of the week and my kids have a holiday from school. Earlier this year, at the end of Ramadan my sister threw an Eid al Fitr party for us. We were in the midst of packing and getting ready for our move and so between her and my mom they had a family party so we could still celebrate without the stress of hosting. It was really wonderful. I know that there is a feeling of needing to go above and beyond for holidays but it is also very possible to create a wonderful day/evening without going over the top. 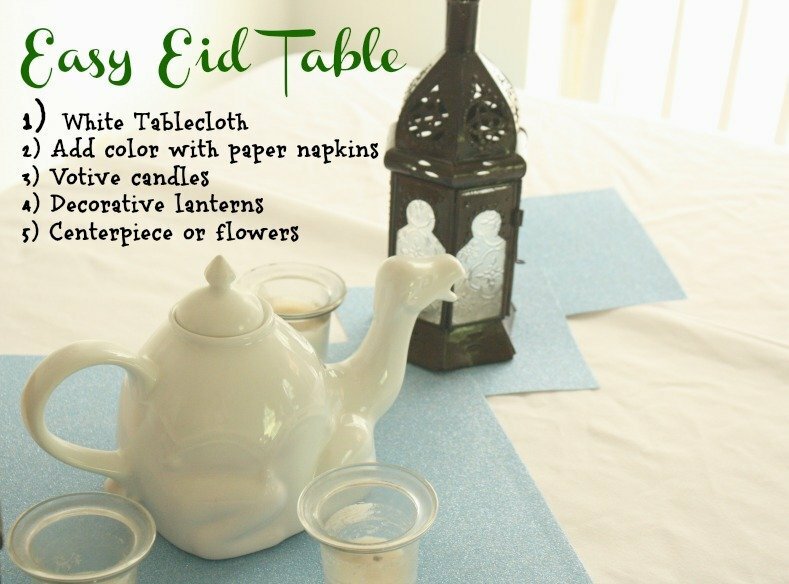 The star of the Eid al Adha table is of course the lamb. Instead of preparing it multiple ways (as is sometimes the case), stick with something easy. 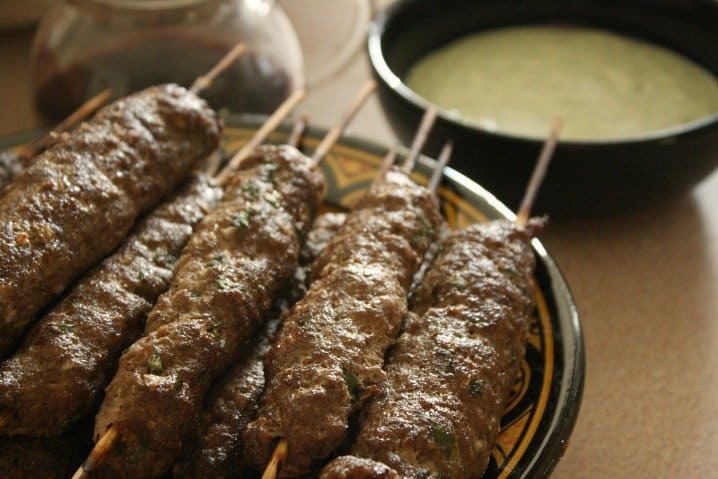 Lamb kebabs marinate quickly and can be grilled outside or under the broiler. This recipe from Nom Nom Paleo was what Ashley used and there were no complaints – it was wonderful! You can certainly eat the lamb alone but she served it with both a pomegranate glaze (on the side) and a mint sauce (on the side). I loved them both but the pomegranate glaze was exceptionally tasty! Place the pomegranate juice, sugar and lemon juice in a 4-quart saucepan set over medium heat. Cook, stirring occasionally, until the sugar has completely dissolved. Once the sugar has dissolved, reduce the heat to medium-low and cook until the mixture has reduced to 1 cup, approximately 70 minutes. It should be the consistency of thick syrup. Remove from the heat and allow to cool in the saucepan for 30 minutes. Transfer to a glass jar and allow to cool completely before covering and storing in the refrigerator for up to 6 months. Finely chop or grate the cucumber, mix into the yogurt and add lemon juice, garlic, salt and pepper to taste. Stir in mint and chill, covered, until serving. I make hummus fairly regularly but Ashley added in a few ingredients that I normally don’t. I loved the flavor! Combine all ingredients except for cilantro or parsley in a food processor and process until smooth. Adjust seasonings to taste. This recipe does great a sweeter tasting hummus but it’s flavorful and a wonderful change up from traditional hummus! 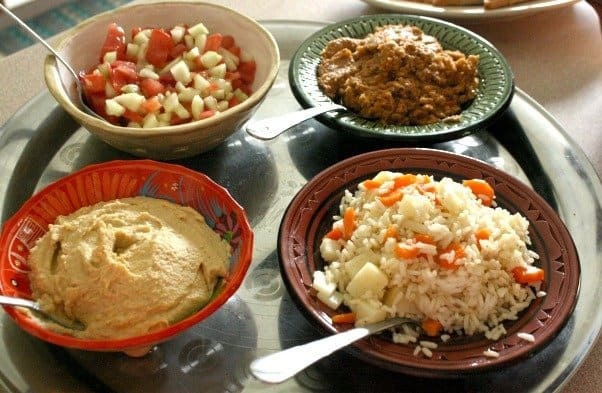 For the main dishes there was also couscous and vegetables. Instead of preparing couscous the traditional way, Ashley opted to use Bob’s Red Mill Couscous Rice, cooked in chicken broth and add some saffron for color. The vegetables were lightly seasoned with olive oil, salt, pepper, garlic, and cumin and then roasted in the oven. Because this meal was all gluten-free she also made this bread that is our favorite recipe. I’m not sure who gets the decorating credit, my mom or sister, but it was easy and beautiful – and child safe – we had 5 of them roaming around! The table was set with a plain white tablecloth and then paper napkins were used to create a little pattern. Votive candles and lanterns worked for fun lighting and appearance. Along with a big bouquet of flowers, and a camel teapot just for added flair. It’s really easy and inexpensive! Who can forget dessert?! 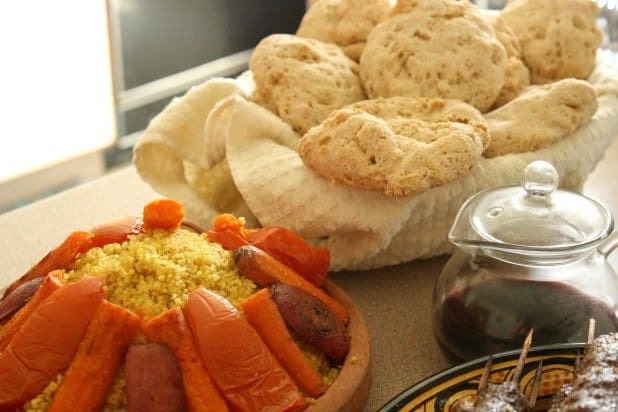 I’m busy in Morocco making cookies for next week and I know these gluten-free ghriba will be on our table. Ashley took a swing at them using my recipe with great results. 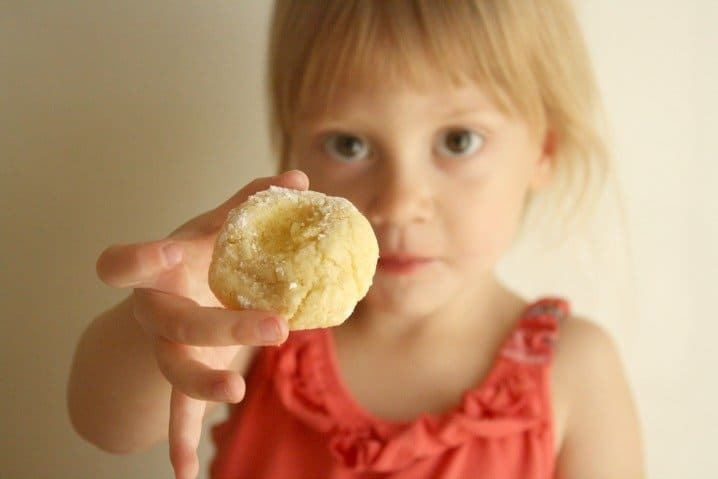 Almond, Vanilla, Preserved Lemon Ghriba are a unique take on their traditional counterparts but kids and and adults love them! My niece here pulls the almond centers out and eats them first! 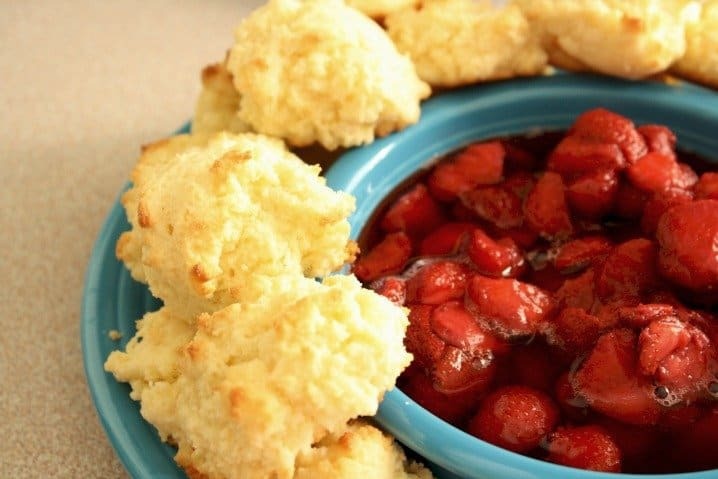 One more super simple dessert idea is to make shortcakes with fruit. Use of the last of summer’s bounty or opt for some cooked down apples or pears in cinnamon and cardamom. Shortcake mix can be bought in a box mix or can be easily made at home too. A little whipped cream and everyone is happy. Looking for more easy Moroccan recipes? I’ve got a bunch! What’s on your Eid menu this year? Consider inviting over a family or someone that may be alone or in a difficult time to celebrate. It really can mean a lot! Wow, this food looks amazing! Some wonderful ideas and recipes here, and I am IN LOVE with that camel teapot!!! I’m sharing this post around. Found you on MKB. Happy Eid! This looks beautiful- wish I could taste and smell it on-line:).